I am so pleased that I keep discovering historical fiction authors who really know how to tell a story. Rosanne Lortz has taken the Crusades, which I have to admit I know little about, aside from Richard the Lionheart, and has written a well-researched and captivating account. I'm not much for battle scenes, but she succeeded in adding just enough to show the harsh reality of war and the mettle it took for these men to fight as they did. While many of the men in the story joined the Crusades for personal gain, for many it was a deeply religious experience. A quest to prove their fealty to their Lord and Church. The main character, Tancred, was one of the latter group. Tancred is a very likable character. It may seem cliche, but I really enjoy characters that have a purpose, a mission to do good, and a character who has principles and honor. Tancred loses his taste for killing in the name of a liege lord, that is, the killing of Christians. He seems to have no qualms in killing Turks or 'Mussulmen' (I'm assuming the name of the time for Muslims?) because they are infidels who have denounced Christianity. Killing is killing, right? But we must remember the time period, when war was common and many wars were fought in the name of the Church. Despite what we might view as hypocrisy, Tancred is a noble man who refuses to swear allegiance to any state, but the Church. In her author's note, Lortz informs that all the characters are true historical personages, with the exception of a few supporting characters. She has breathed life into history. Something that I continue to stress that is the importance of historical fiction. An engaging book such as this is one that will spark an interest in learning more about the Crusades, even in the most lay of persons. A planned trilogy, with subsequent books with Tancred as protagonist, the second and third books are Flower of the Desert and Prince of the East, set to release in 2012 and 2013. I, for one, cannot wait to read about the further adventures of Tancred. You know the Knights Templar, you know Richard the Lionheart—now learn the story that started it all in the adventures of the First Crusade. 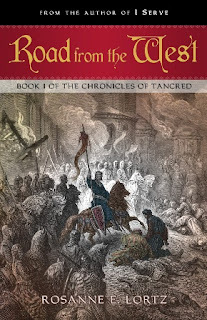 Haunted by guilt from the past and nightmares of the future, a young Norman named Tancred takes the cross and vows to be the first to free Jerusalem from the infidels. As he journeys to the Holy Land, he braves vast deserts, mortal famine, and the ever-present ambushes of the enemy Turks—but the greatest danger of all is deciding which of the Crusader lords to trust. A mysterious seer prophesies that Tancred will find great love and great sorrow on his journey, but the latter seems intent on claiming him before he can find the first. Intrigues and passions grow as every battle brings the Crusaders one step closer to Jerusalem. Not all are destined to survive the road from the West. Check out Rosanne's guest post and the giveaway of Road from the West HERE. See the full tour schedule at Historical Fiction Virtual Book Tours HERE. Great review, Michelle! Thanks so much for hosting the tour and I am so glad that you enjoyed Road from the West!